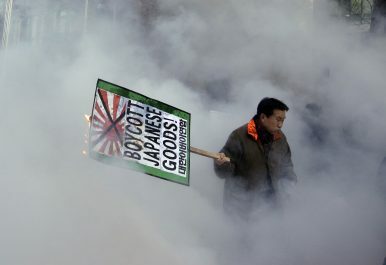 A South Korean protester burns an anti-Japan banner after police officers spray fire extinguisher during a rally against Japanese Prime Minister Shinzo Abe in front of the Japanese Embassy in Seoul, South Korea, Dec. 27, 2013. The move is short-sighted, given the importance of the Japan-South Korea relationship. It is not new to see the anti-Japanese sentiment in South Korea used as a tool to gain public support on the country’s political stage, but one of the latest moves might have gone too far. South Korea’s Gyeonggi-do Assembly recently announced that it plans to submit a proposal to require the use of stickers on school products that were made by certain Japanese companies that used South Korean laborers during World War II. A total of 284 Japanese firms will be included in a list of “war crime companies.” Prominent companies such as Nikon and Panasonic are among them. The number could grow as companies that are invested in, established, or acquired by the listed firms could be included in the list. Once the proposal is passed, about 4,700 elementary, middle, and high schools in Gyeonggi-do province will be required to report their usage of products made by the listed companies and reveal it to the public annually. They will also have to attach the stickers to any products worth more than 200,000 South Korean won ($177). What’s more worrying is that the Gyeonggi-do Assembly is not the only one to take advantage of the country’s anti-Japanese sentiment. The council specifically urged Seoul’s mayor to play an important role in encouraging government-backed organizations in Seoul to cut ties with such firms. The plan is currently under review. Some other provinces even banned their school songs since they were composed by pro-Japan musicians while others changed symbols that are believed to have ties with Japan. Such moves have met backlash from different parts of society. The Seoul-based civic group University Students’ Forum of Korea is among those unhappy with the Gyeonggi-do plan. Calling the plan a “stunt,” the group said it is inappropriate to inject an idea of nationalism to South Korean students in the era of globalization. Bareunmirae Party lawmaker Lee Un-ju also criticized the Gyeonggi-do proposal, saying that it is a short-sighted move to merely encourage anti-Japanese sentiment in Korean society. The plan even drew attention from the central government. Signs are evident that the assembly’s plan is not even fully welcomed domestically. Many point out that it is time for South Korea to stop letting political issues meddle with economic decisions. South Korea is the world’s 11th largest economy by gross domestic product, but its economy heavily relies on exports. Japan is one of South Korea’s main trading partners. The semiconductor and display industries, South Korea’s key export sectors, for instance, are supplied with a large number of parts and materials from Japan. South Korean simply cannot lose Japan. The situation is not that different for Japan. According to the Korea International Trade Association, South Korea and Japan are each among each other’s three largest trading partners. With South Korea’s latest hardline moves, however, Japan is also gearing up for retaliation. Japan is reportedly reviewing the possibility of rejecting South Korea’s bid to join the Comprehensive and Progressive Agreement for Trans-Pacific Partnership (CPTPP or TPP-11). Voices are also growing in Japan that it should limit exports of hydrogen fluoride to South Korea, which is a core part of producing semiconductors. When tensions intensified even more after a military radar dispute in December last year, it is past time for the two countries to find concrete solutions to normalize their relations and stop further losses. But it is still unclear when such a time will come.